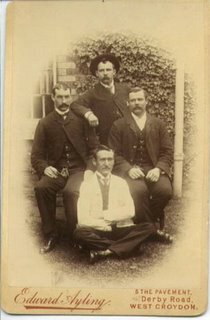 What you don't know is the man sitting down with his hair parted down the middle is my Great great great Uncle Jebidiah . The picture was taken right after the railroad was well into the rockies. They had celebrated a rather hard spot to dynamite the morning the picture was taken. You will notice his left hand is hidding behind the other man because the forefinger was recently blown off in an accident with the charges. He died shortly after in a bar room fight...trying to stop the fight but got in the way of a misplaced knife. Although your story sounds really nice...there was no CD made to verify mine.